Thin Plastic Sheets - A great colour range! There are three ranges of thin plastic sheets thickness 1.5mm and below (1.5mm=0.06"= 1/16th inch approx). They are PVC, Polypropylene and Polystyrene. To look at the High IMPACT Polystyrene click here. Please note that this is not a foamed Polystyrene. It is a solid plastic. Polystyrene flexible but not as repeatedly able to survive flexing and creasing as Polypropylene or PVC. Polypropylene can be repeatedly folded many times before failure. Polystyrene would probably snap after several flexings unless very thin! To look at the availability of PVC and Polypropylenes please carry on looking down this page. PVC is available in Gloss Clear and also Gloss & Matt White. In Black we can supply 1mm upward. Polypropylene: Clear, Opals & many solid & translucent colours. We have a basic economy range with no restriction on the amount of sheets ordered but a mimimum charge of £35.00 plus deliveryt and VAT. Above 5 sheets costs per sheet reduce significantly. There is no picking charge for choosing more than one colour. There will be a cutting charge dependant on the details. We also show a prime range further down the page where different rules apply. The prime range is more expensive but a larger range is avaiiable. 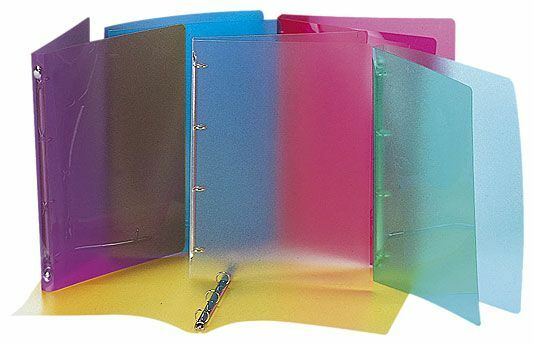 Thin Plastic Sheets - A wide colour range! 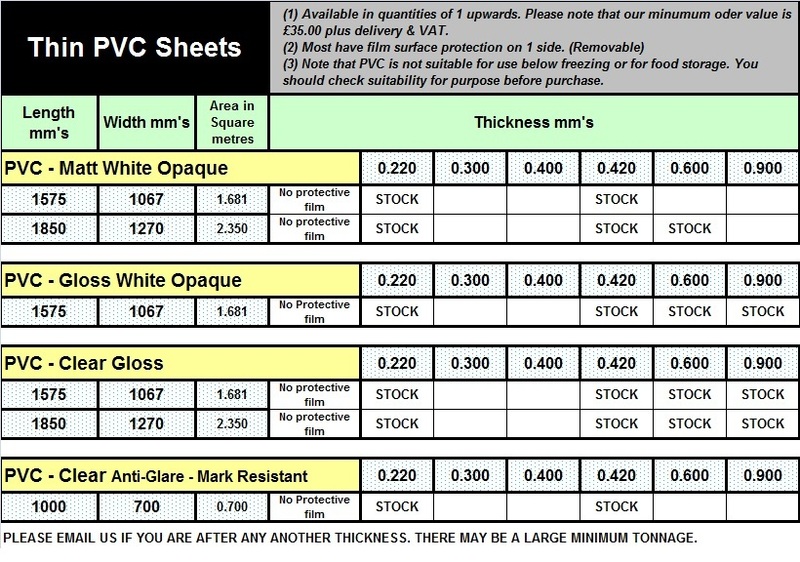 There are three ranges of thin plastic sheets under 1.5mm =0.06"= 1/16th Inch approximately. PVC Clear, Matt & Gloss White & Black Also take a look at Polystyrene as it is available in thin sheets of 1.5mm in a good range of colours. Polystyrene is not as flexible as Polypropylene or PVC the latter can be bent back on its self many times, Polystyrene would probably snap! We can cut these by guillotine or by a shaped knife into almost any shape you need. Printing: The thin Polypropylene sheets can be are treated on both sides to give improved printing adhesion. This treatment remains effective from the date of production for 6 months. Our range is not guarantee suitable for printing unless you obtain a certified corona production date label. Some litho inks can be used with the corona treatment in effect. Some Litho and Screen printing inks are acceptable but Litho inks with a high mineral oil base should be avoided. Test them first. Vegetable / Soya based inks are usually suitable. Film lamination sealing is recommended if they are in contact with any Litho printed surface. They can be Hot Foil Blocked. Brass or steel block is preferred. The thin Polypropylene sheets can be creased at room temperature up about 1400 microns. They can also be punched, perforated, welded and sewn. PVC - please ask if there is any technical data you require. You can also cllick POLYSTYRENE as it has a good colour range but is harder and does not bend as much or fold like Polypropylene. Colours, Finishes & Size availability. 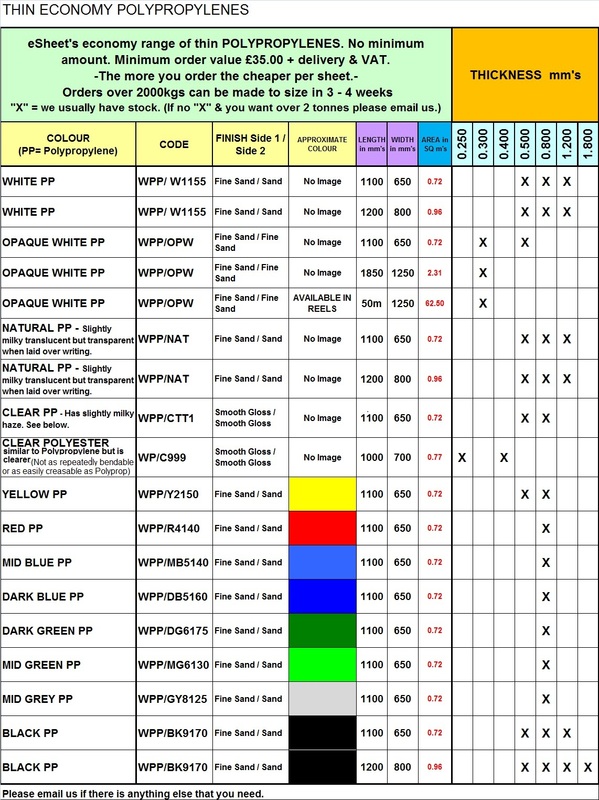 PVC - There is no colour chart, as availability chart below shows, they only come in White, and Clear Gloss & Matt. We can supply Black PVC from 1mm thickness. This range of colours is less extensive but less expensive than the PRIME RANGE below. The colours and finishes are very similar but not identical. If you choose a colour from this range then try and stay choosing in this range as it is more expensive to mix ranges.